Strips of red pepper and the bold flavors of lime, cayenne and cilantro help put the Southwest style in this Caesar salad for six. Place mayo, lime juice, onions, ground red pepper and salt in food processor or blender container; cover. Process until well blended. Gradually add oil through feed tube at top, processing until well blended after each addition. 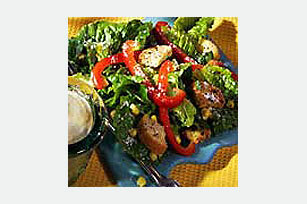 Toss lettuce with the croutons, corn, bell peppers, cilantro and cheese in large bowl. Add mayo mixture; toss to evenly coat. Serve immediately. Substitute 1/2 cup KRAFT Classic Caesar Dressing mixed with 1/2 tsp. ground red pepper (cayenne) for the homemade mayo dressing.